With the amount of talent that exists in the league, it has become a tradition for players from several different schools to come together to compete in the Patriot League All-Star basketball games. The games, that take place on an annual basis after the teams wrap up their regular season, feature the best competition the league has to offer with Patriot League Keenan Division teams taking on those of the Fisher Division. Both games took place on Friday, Mar. 8, at Whitman-Hanson Regional High School and the Lakers had representation in both of them. On the girls side, Holly Reeder-Morning got the nod for Silver Lake. She was one of nine players on the Keenan team this time around. The team featured three players from Plymouth North, another three from Duxbury and two from Whitman-Hanson. The Hingham girls did not have any representatives there, however, as they were still competing in the Division 2 South playoffs. Ultimately, the Keenan ended up winning that contest over the Fisher, 71-70. Lily Gustafson represented the Lakers well in the three-point contest as well prior to the game. She exemplified her ability from beyond the arc and lasted three rounds into the contest. The Silver Lake boys had three participants in their respective All-Star game: Danny Duggan, Josh Gilbert and Josh Murphy. Murphy was also the team’s participant in the three-point shootout, and he made seven of them. Since none of the boys’ teams were still in the playoffs, all of the teams competed in the All-Star game, and the Fisher Division boys beat the Keenan Division 110-90. This past season, the Silver Lake boys’ team finished the year at 13-9 and beat Stoughton in the preliminary round of the Div. 2 South playoffs before falling to Tech Boston in the first round. The girls’ squad was on the younger side and finished the year at 4-17. Facing tough competition early in the season, the Silver Lake High girls’ basketball team had a hard time picking up wins at the beginning of their season. However, they continued to grow as a unit as the year progressed and ended up enjoying more success in the second half of the year. 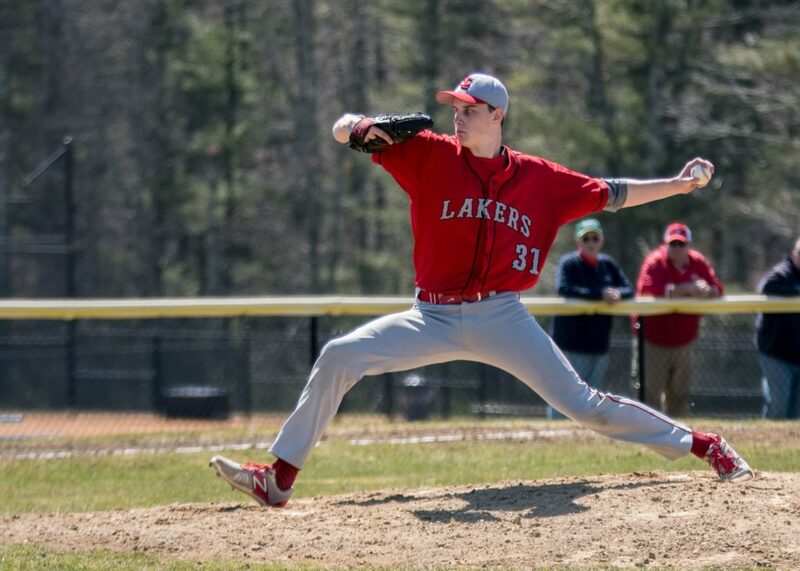 Six of the first seven teams the Lakers faced at the start of the season ended up being tournament teams: Bridgewater-Raynham, East Bridgewater, Duxbury, Pembroke, Plymouth North and Falmouth. While they started the year off by losing their first five games, the team coached by Olly deMacedo did pick up wins against New Mission, North Quincy and Quincy in the final month of the season to finish the year at 4-17. Once Holly Reeder-Morning come back to the team from her ACL injury midway through the season, they saw an uptick in their offensive production and their overall success. A junior this season, she will be back again next season for her fourth year on varsity. This season, the Lakers had a healthy mix of veterans and younger players, so experience should not be a big issue for them next season. This time around, they had five seniors on their roster: Izzy Ruprecht, Jessica Stas, Brianna Villanova and Stephanie Bennett. On the other hand, they will have plenty of players coming back next season, who are varsity contributors. These include players such as Molly Turbush, Riley Dunphy, Erin Demacedo, Lily Gustafson, Lilly Noonan, Kiley O’Brien and Natalie Bouchard, as well as Reeder-Morning. That said, the Lakers have the foundation set so that they can keep working hard in hopes of enjoying more success in the future–and it is certainly attainable. After all, the team won 16 games and made it to the tournament in the 2017-2018 season. Make that nine wins in a row for the Silver Lake High boys’ basketball team following their first playoff bout. The Lakers had no issue taking care of Stoughton in the preliminary round of the MIAA Division 2 South Sectional playoff bracket. The Lakers took down Stoughton 60-46 and improved to 13-8 on the season. On offense, senior guard Josh Gilbert (16 points) and junior forward Nolan Hughes (14 points) led the way. Speaking of offense, the Lakers shined on the attack early in the contest. They went on a 9-0 to start the second quarter and with 5:24 left in the first half, their lead stood at 14 points, 26-12. For the rest of the first half, both sides, played well defensively, but the Lakers had a 28-18 lead headed into the second half. The Lakers got off to a strong start in the second half which included three pointers from both Dan Duggan and Josh Murphy which gave the team a 16-point lead, 38-22. From there however, the scoring effort was back-and-forth between Silver Lake and Stoughton. The Lakers held a safe lead, the highest it got to was 19 points, 51-32, early in the fourth quarter. In the fourth, it also never dipped below 12 points, as it was a 55-43 game with 1:43 remaining. That said, there was not enough time for Stoughton to make a comeback at that point. With the win, the Lakers advanced to face No. 2 Tech Boston on the road on Wednesday, Feb. 27. A loss there will have ended their season but if they came out on top, they will face either Hingham or Falmouth over the weekend. Varsity experience and senior leadership were key factors in the Lakers success this season. The team featured 10 seniors including: Anthony McNiff, Dan Dugan, Jack Peterson, Dan Coffey, Matthew Bettle, Josh Gilbert, Josh Murphy, Cam Danahy, Brandon Lorizio and Will Cauchon. In their final home game of the season, the Silver Lake High boys’ hockey team clicked on offense, defense and in net. As a result, they trounced Blue Hills 7-2 on Saturday, Feb. 16, improving to 7-10-4 on the season. Kevin Cardarelli led the way, putting up a hat trick. In addition to his three goals, senior captain David Marani had a pair while Andrew Johnson and Cameron Cavicchi each found the back of the net as well. Plus, Nicholas Solari dished out a team-high three assists in the win. Freshman Grady Sullivan picked up the win in net and once again gave the Lakers exactly what they needed. The game was also senior night for the Lakers which means they honored their five seniors prior to the game. This season, such names include: Sean McNeilly, Ryan Sullivan, senior captain Alex Heffernan, Marani and Johnson. The win was also crucial for the Lakers as it kept their playoff hopes alive. While the Lakers will not win 10 games this regular season, beating Blue Hills put their record against fellow Div. 3 opponents on the season at 3-4-1. This meant that if they won their bout against Rockland on February 20, they would earn a spot in the MIAA Div. 3 playoff bracket thanks to the Sullivan Rule. This also explains how the team made the playoffs in each of the past two seasons. This season, the Lakers scoring effort has been spread out. Headed into this week, their top-three scorers had the exact same point total on the year. Marani, Heffernan and Cardarelli had each put up 23 points apiece. Plus, Johnson was just behind them with 21 points. That said, the Lakers will have to replace three of their top four scorers on offense next season but in terms of defense and goaltending, they will be loaded with experience. Eight — that is the number of games the Silver Lake High boys’ basketball team had won in a row. At the midway point in the season, the team had a losing record and their playoff chances were in doubt, but they have been dominant ever since. The latest example of this came in their home Valentine’s Day bout against the Hingham Harbormen. In it, the Lakers overcame a double-digit point deficit in the second quarter and picked up a 70-58 victory. The win improved their record to 12-6 on the season. 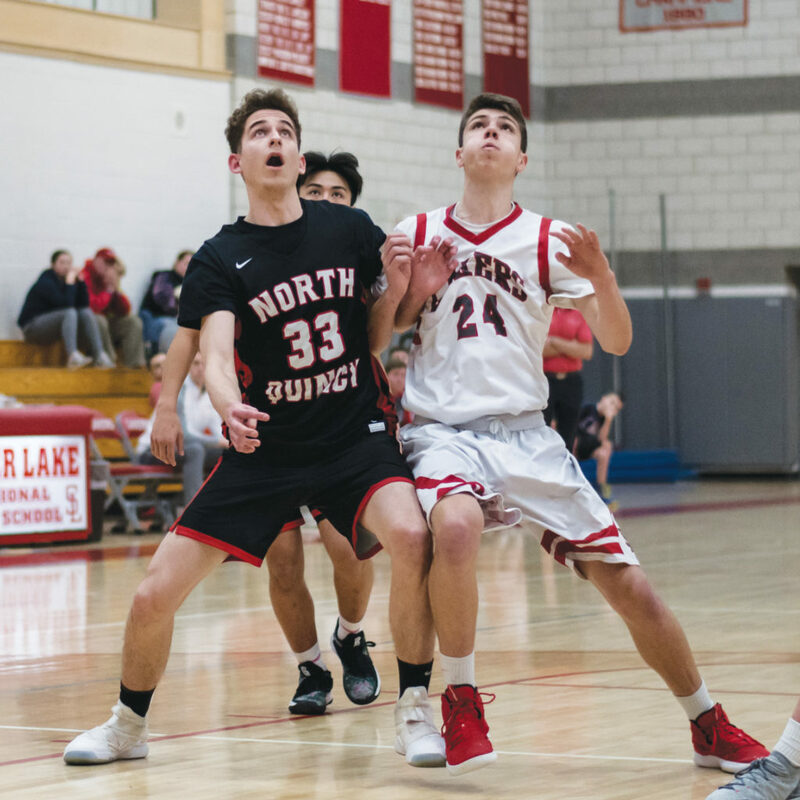 With the team trailing 30-17 a few minutes into the second quarter, Josh Gilbert hit a three-pointer and Josh Murphy followed it up with a fast break to cut Hingham’s advantage to single digits. The team continued playing sharp defense and early in the third quarter, a Murphy three-pointer made it a 37-33 game. Hingham then hit a three, but the Lakers responded with a 13-0 run of their own. Nolan Hughes started the run with a bucket. Murphy followed up with a layup. Then Gilbert hit a three to tie it at 40-40; Gilbert then gave the team the lead on a trey. At the end of the run, they led 46-40. The fourth quarter was hard fought, but the Lakers got hot towards the end of it and ended the game on a 12-4 run to secure the victory. Gilbert led the team’s offense, scoring a team-high 23 points against Hingham. In addition to the points, he also grabbed eight rebounds and dished out four assists in the winning effort. The Lakers excelled from three point territory in the win, hitting 47 percent of their shots from outside the arc. This weekend, the Lakers will likely find out who they are set to face in the playoffs next week. The Silver Lake High girls’ swim team will have some competitors at the state championship meet later on this month. That is because they have had strong performances during Patriot League meets this season, showing their talent in a number of categories. Junior Alexis Connors will make it back to states for the third straight year and will show off her versatility in the process. She qualified for the state championship in three different events through the Lakers first five meets of the season (in which they went 2-3). Leading the way for the team, she has earned the right to compete in the 200 freestyle, the 200 individual medley and the 500 freestyle. Plus, qualified to compete in sectionals in the 100 breaststroke. To qualify in the 200 freestyle, she swam a 1:56.71 in the team’s meet against Duxbury last month; in the 200 IM, her first place finish against Quincy (2:17.56) got the job done; and in the 500 freestyle, her winning time against Duxbury (5:08.55) also got the job done. She qualified for sectionals in the 100 breaststroke against Rockland (1:14.71). Connors will not be going to the state meet alone. Senior Katherine Morrissey has also qualified to compete there for the Lakers in the 100 butterfly. She swam a 1:01.13 against Duxbury in order to earn the nod. She will also compete in the sectionals meet in the 100 breaststroke. The girls 200 freestyle relay team also qualified for sectionals earlier in the season. In addition to Morrisey and Connors, junior Chloe Duran and sophomore Aly Truckenmiller round out that team. The Lakers wrapped up their regular season on Wednesday, Jan. 30, against Hanover. Now, a handful of their swimmers will continue practicing to prepare for sectionals and states–although those dates have not yet been announced.